﻿ Corbin & Snyder Furniture Co. - Ohio. Find It Here. 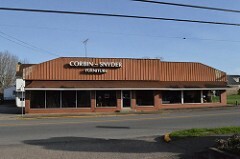 About Corbin & Snyder Furniture Co.
A locally family owned retail furniture store serving southeast Ohio and neighboring West Virginia and Kentucky.They carry such furniture as: Living Room Suits, Kitchen Tables, End Tables, Coffee Tables, Sofa Tables, Wing Back Chairs, Recliners, Bed Room Suits, Mattresses, and much more!A local place with local people always willing to help you find that one-of-a-kind piece to add to your home!